Thanks in part to a reader suggestion last week, we decided to check out the weekly food fair at Wat Mongkolratanaram off Palm River Road this past Sunday. 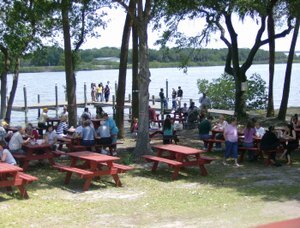 We had first heard about Wat Tampa's food fair in an article by Chris Sherman of the Times a few months ago. The place sounded great. We still weren't sure, though, what to expect at Wat Tampa. All we knew was that we liked Thai food and that our money would go to a good cause. 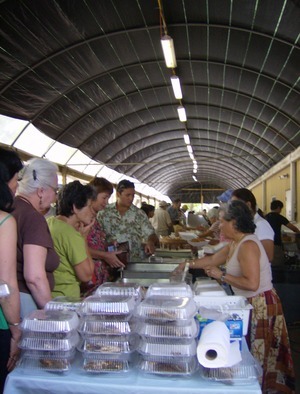 All proceeds from the food fair go to the building of a new Buddhist temple and other facilities. The fair is run by volunteers and all the food is donated. We arrived in the early afternoon to find the place packed with people in a sort of open-air market atmosphere. It took us a few minutes to get our bearings and figure out how things work. Most dishes are $3 to $5 a piece. Drinks like Thai tea are just a buck each. Even though we didn't really know what we were doing, everyone was friendly and helped us out. A few minutes later, we had several plates of Thai food for a bargain price. 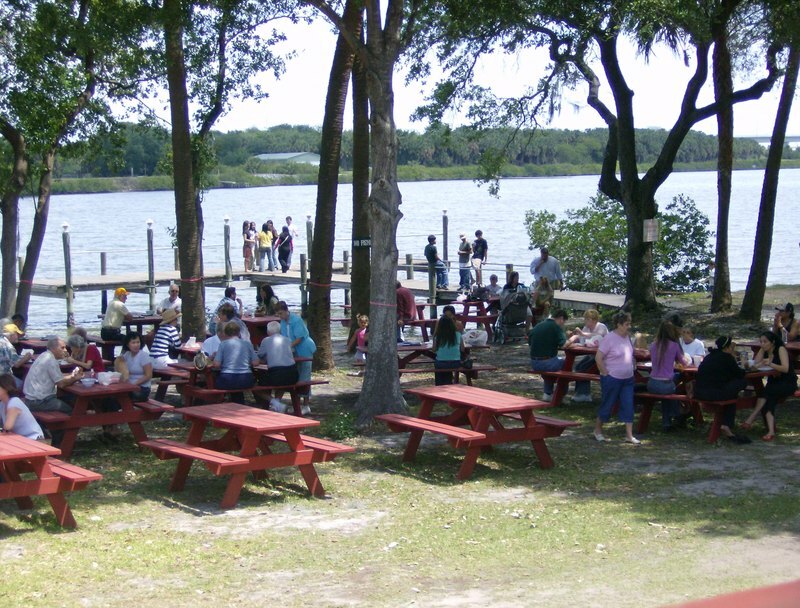 We sat down to eat at one of the many red picnic tables that line Wat Tampa's grounds along the Palm River. We certainly didn't feel like we were in Florida. The dishes we tried included a traditional pad Thai, a spicy curry, a roasted chicken, and spring rolls. We also tried fried slices of vegetables (tasted like plantains or potatoes?) that were sweet and interesting. For dessert, on Chris Sherman's recommendation, we ordered coconut rice cakes. This was clearly the most popular item at the fair. The rice cakes reminded us a little of of marshmallows. 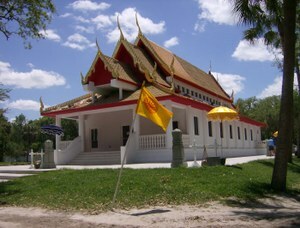 Overall, our visit to Wat Tampa was a great experience - a combinat ion of a good affordable lunch and a nice outing. Even if you're not a big fan of Thai food, I think you'd enjoy walking around the grounds and checking things out. Again, sitting on the peaceful river I felt like I had been transported to another place and time. The food fair is open each Sunday from 10:30am through the afternoon. Palm River Road is off US 41/50th Street not far from the exit off the Crosstown. Bottom-line: If you're looking for something different to do for lunch one Sunday, check out the weekly Thai food fair at Wat Tampa. Enjoy good food at good prices and your money goes to a good cause. Looks can be deceiving. Especially at the dully-named-but-tasty Thailand Restaurant on S. Dale Mabry, SOG and just a couple of blocks from the base. From the outside, the restaurant looks semi-abandoned with paint badly peeling (could this be the original coat of paint from when the place first opened in 1979?) and with letters missing from the sign on the restaurant's exterior. Inside, though, Thailand Restaurant is clean and surprisingly better decorated than many mid-priced Thai restaurants and the polar opposite of how the place looks outside. We first tried Thailand Restaurant a few months ago, were pleasantly surprised by the food and service, and have been back several times since. On our most recent visit last Friday evening, we ordered the chicken satay, which are grilled chicken strips served with a peanut dipping sauce and freshly sliced cucumber, as our appetizer. For our main course, I ordered the panang curry with pork and Traci ordered the hot & spicy chicken. We asked for both dishes "Thai hot", which elicited a warning from our server, until we explained we love spicy food and that I grew up in New Orleans. The satay was good, but not outstanding. My panang curry was tasty and Traci's hot & spicy chicken was a mix between being painfully and enjoyably spicy in a good way. On a previous visit, I enjoyed the pad thai with chicken. The Thai coconut soup was also good. We also tried the chicken curry puffs on a previous visit. They were interesting, but I wouldn't try them again. 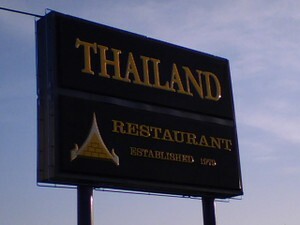 Overall, the food at Thai Restaurant has been good, the service is friendly and prompt and the atmosphere is pleasant. The only other Thai restaurants in Tampa I've tried are Royal Palace Thai on SOHO and Thai Thani at Channelside. I enjoyed Royal Palace, but Thailand Restaurant is more convenient for us. Thai Thani seemed overpriced with mediocre food and service, which I guess is to be expected at Channelside. Thai Sweet Basil on Northdale sounds like a winner. For those of you in St. Pete, a good choice for lunch is 9 Bangkok Thai Restaurant on Central Ave. The place doesn't look like much on the outside, but has good lunch deals. Ratchada Thai Restaurant on First Ave N. is also pretty good. I do have to ding Thailand Restaurant for a whopping 14 critical violations on its inspection last fall. These violations were all corrected on a follow-up visit. Good thing I don't check these beforehand. So what's your favorite Thai restaurant in Tampa Bay? Bottom-line: Ignore the bland name and the ramshackle exterior. The nearly 30 year old Thailand Restaurant turns out very good Thai food at reasonable prices in a surprisingly nice environment. Inspection Scorecard: Last Inspection: October 2006 violations - Critical (14), Non-Critical (4). 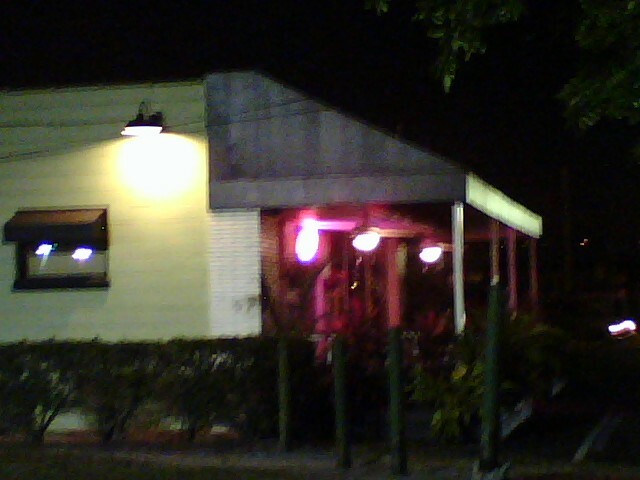 Thanks to Cappy's Pizzeria on Bay to Bay in Palma Ceia for being rude to us this past Friday evening. If it wasn't for you, we wouldn't have stumbled upon little Vino E Pasta on Gandy instead. Our original plan for dinner on Friday had been to try out Cappy's again. This time we planned to order Cappy's New York style pizza. The place was crowded when we got there with folks standing around for tables, which was fine and what we expected. We put our name on the list at the front door and helped ourselves to beers from the cooler. After waiting a few minutes, we noticed that one of the tables on the small deck outside had opened up. We were pretty sure we had been told on a previous visit that outside was "open seating." Just to make sure, Traci asked one of the guys behind the counter if outside was open seating. He said it was indeed seat yourself so outside we went to the table. Within a minute of us sitting down, the server told us that, sorry, we had to leave. I asked why and she said she had promised the table to another group. I explained that we had asked at the counter before taking this table (i.e. we didn't just "steal it") and she told me the guy "didn't know what he was talking about." Next, a guy who I assume was the manager, walked up after we had already exited the table and were walking out. Instead of being apologetic or offering us another table or letting me explain things, he tell us "just leave" and walks off. Wonderful. The service was mediocre previously, and I didn't like their Chicago style pizza, so shame on me for giving the place a second chance. Never again. My experience at Cappy's left me in a pretty crummy mood and I wasn't really up for waiting in another line. As we turned onto Gandy we thought of Vino E Pasta, a little Italian restaurant near the corner of Gandy and Himes that we had passed many times before but hadn't tried. Now seemed like as good a time as any. Vino E Pasta doesn't look like much from the outside, but inside, with its dim lighting, the restaurant was nicer than we expected. It didn't take long to notice that this place provides a level of service and attention that is much higher than you typically get at mid-priced restaurants around town. As the name Vino E Pasta implies, the restaurant's fairly simple menu is built around wine and pasta. An interesting twist is that the restaurant has a fixed price wine list (all wines are around $5 per glass and $24 per bottle if I recall). We're not big wine drinkers, but after the Cappy's fiasco we figured why not and ordered a bottle of white. We also received a complimentary bruschetta sampler. For my entree, I went with one of the specials, a salmon stuffed with crab meat and pasta on the side. Traci decided upon a penne pasta with a marinara sauce with sausage. Each dinner came with a nice side salad. My salmon with crab meat was excellent as was my pasta. Traci's pasta was good too. Going all out, we split an order of tiramisu for dessert. This ended up being a pricey meal with the wine and dessert, but still a good deal. I think you could do dinner for around twenty bucks per person. This may not be the best Italian in town, but if you're looking for a neighborhood spot where not only is the food good, but they're likely to treat you like a regular even on your first visit, then this place fits the bill. Bottom-line: Thanks to a rotten attitude from Cappy's, we had the chance to try Pasta E Vino. Good food and friendly service was a pleasant surprise at this nice little neighborhood Italian restaurant.